Despite having almost 60,000 licensed registered nurses in South Carolina, according to the American Association of Colleges of Nursing, the US Department of Health and Human Services predicts South Carolina will fall short of demands by 2025. To meet expanding nursing needs, the state recently passed the Critical Needs Nursing Initiatives Act to provide funding for faculty procurement and nursing scholarship aid. Individuals who are considering a career in nursing, or looking to advance in the field, can use the following guide to find out about educational and licensure requirements in South Carolina. With 30 state-approved undergraduate programs for individuals looking to become registered nurses, prospective students have no shortage of options available in South Carolina. Nurses who have been working in the field and are now considering an advanced role can also choose from several master’s and doctoral degree programs. 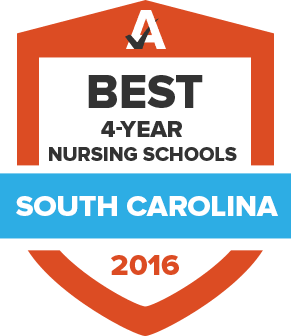 Use the search tool below to locate an approved nursing school and program in South Carolina that’s matched to your specific needs. The South Carolina Board of Nursing is the state’s Department of Labor agency charged with overseeing the licensing of registered nurses, licensed practical nurses and advanced practice nurses. The board is also responsible for licensing renewals and overseeing the Nurse Licensure Compact agreement that allows nurses from other member states to transfer their licenses to South Carolina. Here you’ll find a list of requirements for those seeking a nursing license for the first time in South Carolina, as well as how to renew it when it is time. Applicants hailing from a member-state of the National Licensure Compact (NLC) must apply for multistate licensure in their state. Those from a state that is not part of the NLC must apply for a single-state license. South Carolina-based nurses are required to renew their license on every even-numbered year by midnight on April 30. Candidates for renewal must show they have completed 30 hours of approved continuing education credits during the previous two years. The fee to renew an RN license is $75. If a nurse needs to reinstate or reactive his or her license, he or she must complete the appropriate application and pay $60 for reinstatement or $50 for reactivation. They will also need to complete a new criminal background check. More information about earning and renewing an advanced practice nursing license is available at the South Carolina Board of Nursing. According to the Office for Healthcare Workforce Analysis and Planning, the number of registered nurses in South Carolina has consistently grown since 1996, and this isn’t expected to change anytime soon. Nurses in the state are part of a flourishing industry, with attractive salaries and options for advancement. Review the following statistics to learn about the range of salaries and positions throughout the state. Founded to promote continuing education among CRNAs in South Carolina, this organization also provides legal support and a voice in the legislature for nurses and their patients. The South Carolina Association of School Nurses is a member organization for school nurses in South Carolina. Its mission is to promote and advance the quality of school health services and health education throughout the state. The South Carolina Nurses Association is an affiliate of the American Nurses Association and is dedicated to furthering the careers of nurses in South Carolina and advocating for better health care policy. SCONL is an affiliate of the South Carolina Hospital Association and is open to all registered nurses in the state. The organization aims to improve nursing practices and create networking opportunities for its members. This pre-professional organization for nursing and pre-nursing students provides leadership experience, educational opportunities, networking events, and information about careers in nursing.